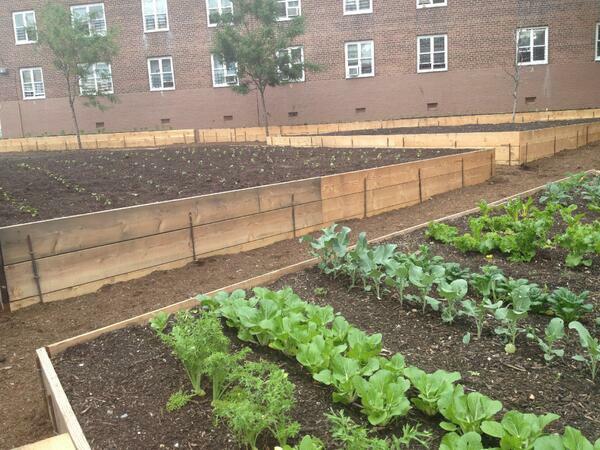 About a year ago, the City Council approved a comprehensive rezoning plan for East New York, the first of a dozen neighborhoods that the city targeted for new land use rules in an effort to develop more housing, including affordable housing, and improve community amenities. As with any rezoning, the plan approved in April 2016 was many months in the making and negotiated in close consultation with the local City Council member, in this case Rafael Espinal, who had significant influence over the designs and final say on the plan’s passage in the Council. Now, Espinal, his district, and the de Blasio administration are seeing the early stages of the East New York Neighborhood Plan put into action, though the effects of the rezoning will only be seen and felt in stages over decades. The plan brings with it major investments in the community, but also more density and gentrification, neighborhood improvements that can benefit current residents while also endangering their ability to afford the area long-term. 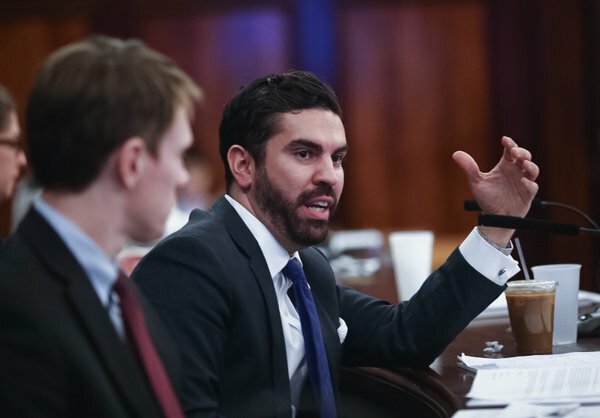 In an interview last week at his legislative office in Downtown Manhattan, Council Member Espinal touted what he delivered for his community, and praised the city’s commitment to fulfilling its many promises as it gets ready to begin repaving streets, designing public parks, and opening a much-awaited community center by the end of this year. While critics of the final deal reached by Espinal and the de Blasio administration worry that even the rent-stabilized affordable housing will not be affordable enough for current residents, no one can deny that hundreds of millions of dollars are flowing into a community that has among the highest poverty and unemployment rates in the city. In negotiating the plan with the administration, Espinal faced immense political pressure while attempting to balance parallel and competing interests -- an administration that wanted to prioritize housing development; a community that wanted deeper affordability than was being offered; and a neighborhood that needed jobs and economic development after years of stagnation and being underserved. 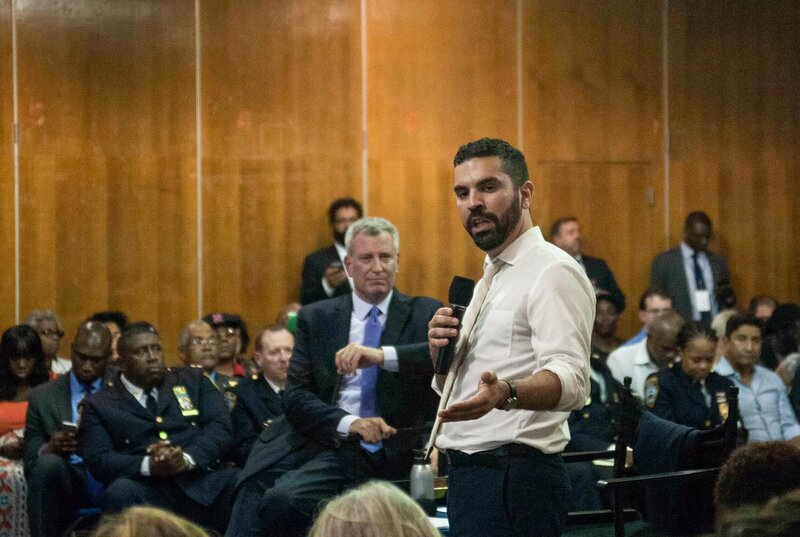 Espinal came out of negotiations with $267 million in promised capital investments -- money for schools, parks, infrastructure -- in what will likely be the largest neighborhood rezoning the de Blasio administration attempts. Of the 10 to 15 neighborhoods the de Blasio administration may attempt to rezone, East New York’s is the only plan that has passed thus far. The rezonings are about neighborhood development, but also key to the mayor’s plan to create and preserve 200,000 units of affordable housing. The East New York rezoning process itself was a major test of the administration’s commitment to equity in development and to ensuring that investment in communities doesn’t mean wholesale gentrification and displacement, issues that will be watched over time. Espinal listed off progress on the various projects underway -- the district’s first state-of-the-art community center in decades is expected to open by the end of this year; the Brooklyn Parks Department has received funding for a number of local projects and is set to begin work; the Department of Transportation is ready to “put the shovel in the ground next month” for the planned streetscaping of Atlantic Avenue; and the nonprofit Phipps Houses is ready to break ground by the end of the summer on a lot to build 1,000 units of 100-percent permanently affordable housing. The city has also received applications for developing another 200 units at a city-owned site, again for housing that will be 100-percent permanently affordable -- meaning that rent caps will be in place to ensure that residents of specific income bands don’t pay more than 30 percent of their income in rent. 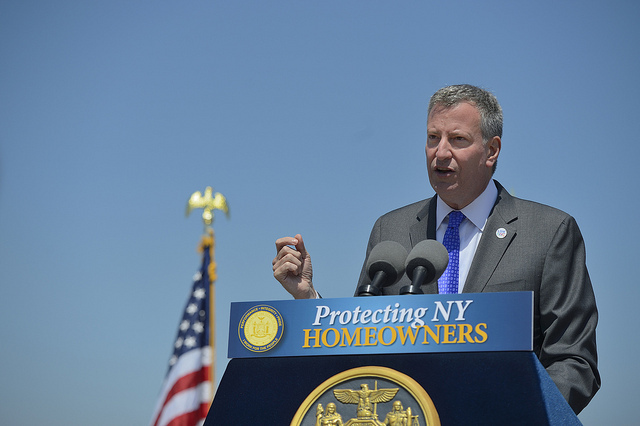 The specifics of those income thresholds was part of the debate over the rezoning and has been part of the overall discussion of de Blasio’s housing plan, with some elected officials and activists pushing for deeper levels of affordability. 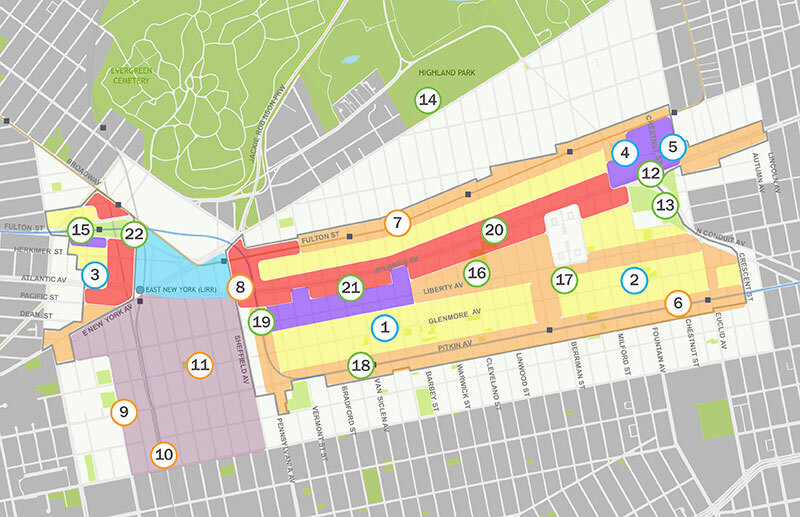 The East New York plan includes two of four options for Mandatory Inclusionary Housing, which requires developers to set aside a certain percentage of units under rent thresholds amid other market-rate units. One of the bands requires that 20 percent of new units be created for households making up to 40 percent of Area Median Income ($31,080 for a household of three) and the second option requires 25 percent of units at 60 percent AMI (including 10 percent at 40 percent AMI). Developers will be able to choose which of the two options they prefer when building on a parcel of land. Additionally, a working group of city agencies is studying the legalization of basement apartment units, and is due to issue its report soon, based on which $12 million in city funding could potentially help homeowners retrofit about 1,200 basements for residential purposes, creating another potential source of housing affordable to lower-income residents. That funding has yet to be allocated but is one of the commitments made by the administration. For another key piece of the plan, the School Construction Authority is seeking public review for a 1,000-seat public school, and two community visioning sessions have been held so far. And, a Workforce1 job training center, run by the city’s Department of Small Business Services, opened in December. “So everything that we fought for and everything that the mayor committed to delivering is actually coming to fruition,” Espinal said. Still, the process is not without its anxieties. With rapid development comes gentrification, for better and worse, and there is fear about rising rents and displacement -- for both residential and commercial tenants. De Blasio has long-argued that the best thing for New Yorkers, especially low-income residents, is to harness development and gain concessions from developers. He has also shown a willingness to invest city money into affordable housing and community parks, among other things. Though the neighborhood may have the blessing of capital commitments from the mayor, even those might not be immune to the larger pressures of the annual budget process at the city, state and the federal level. To bolster accountability and transparency, the City Council passed legislation in December, sponsored by Espinal, Public Advocate Letitia James, and Council Speaker Melissa Mark-Viverito, which mandates that the administration maintain an online public list of commitments made during a land use review process, including rezonings. The details of that online portal are being ironed out with the administration and it “should come live pretty soon,” Espinal said. Concerns about rising costs and gentrification are harder to allay. Before the rezoning plan passed, community advocates warned about the effect a rezoning could have on the neighborhood. New York Communities for Change was one group that opposed the plan, and protested Espinal’s support for it, mainly calling the affordability levels of the housing inadequate. They even threatened to run a primary candidate against him in his upcoming reelection bid (though it appears they are not following through). In the weeks leading up the Council’s vote on the rezoning, and on the day of the vote itself, the groups held rallies, calling for a “no” vote from Espinal, which would’ve effectively killed the plan altogether. The full City Council, by tradition, not statute, votes with the local representative on land use matters. With Espinal’s blessing, and a lot of praise from colleagues for the deal he struck, the plan passed nearly unanimously. The one “no” vote was from neighboring Council Member Inez Barron, who actually represents a small piece of the rezoned area herself. Barron worried about affordability and gentrification. “One year later, tenants are still being harassed, rents are rising, and we still have a rezoning plan that will not create affordable units for the people of East New York,” said Renata Pumarol, deputy director of New York Communities for Change, in an email. Among the adverse effects that NYCC claims the rezoning has caused are rising rents along the L Train corridor and along the 2,3,4 and 5 subway lines, minimal affordable housing development, predatory land grabs, and tenant harassment. Pumarol said in the email, as an example, that monthly rents at Marcus Garvey Village for certain families increased from $1700 last year to $2100. Espinal brushed aside the criticism that was levelled against him, even as he acknowledged that housing speculation was an expected trend that was hard to contain. Housing speculation kicked off well ahead of the plan even being approved as word spread that the city had identified East New York for redevelopment. 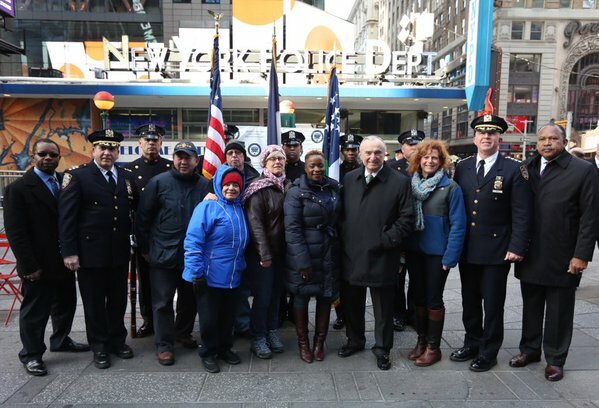 The rezoning plan attempted to ameliorate some of those effects, by creating a Homeowner Helpdesk and by providing legal assistance to those facing eviction in housing court, a program that was recently fully funded by the mayor. 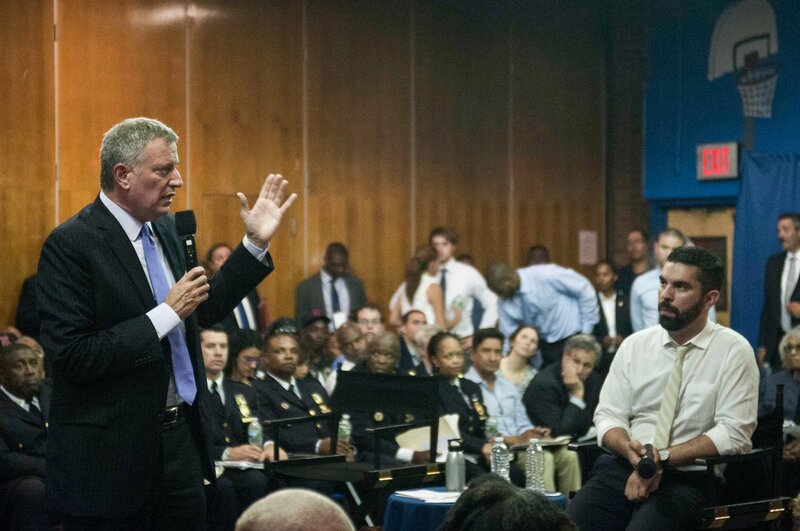 “It’s a snowball that started rolling a long time ago, coming in from Williamsburg,” Espinal said, referring to one neighborhood among several that de Blasio often cites when talking about misguided past rezonings that did not deliver for the community already there. “Bushwick has seen a lot of gentrification, and has seen a lot of the negative effects of that because government didn’t intervene at all,” Espinal added, mentioning another of the neighborhoods de Blasio also cites. The city’s Mandatory Inclusionary Housing policy is also dependent on drawing real estate developers to a neighborhood. That’s part of what the city is relying on for meeting a 10-year target of 6,000 new units in East New York, with at least half of them affordable. And the market pressures that may affect the community, Espinal said, would be offset by first creating 1,200-1,300 units of permanent affordable housing within the next two years. The challenges for the community aren’t limited to the stock and costs of affordable housing. Relatedly, though, East New York has one of the city’s largest concentrations of homeless families. The Partnership for the Homeless estimates that more than a third of East New York families are poor and nearly 40 percent of its children live in poverty. De Blasio has struggled to control homelessness citywide, and often references his affordable housing plan as one of ways the city will reduce homelessness in the long-term. The rezoning plan says nothing directly of taking on homelessness, and a new homelessness plan the mayor recently outlined dictates the opening of 90 new shelters while the city stops using commercial hotels and scatter-site apartments to house homeless New Yorkers. 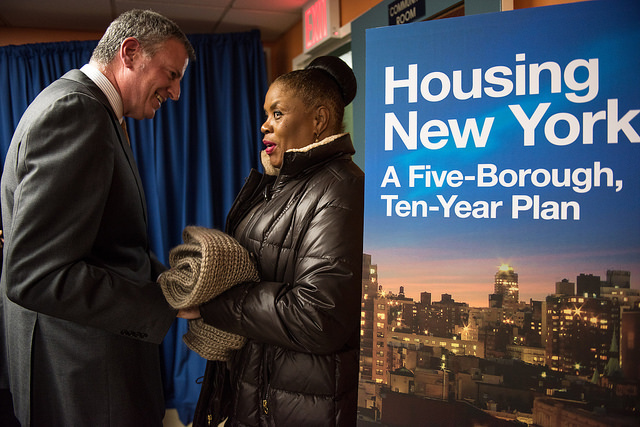 It is unclear how many new shelters the city may target for East New York. But, part of the rezoning deal involved the closure of two homeless shelters in the district. The mayor has promised a new shelter siting policy that prioritizes proximity to a homeless person’s most recent address and support center, keeping homeless people close to their communities. This principle raises concerns in communities like East New York that shelters could be concentrated in already-overburdened neighborhoods. That cyclical logic is what bothers Espinal. Jaclyn Rothenberg, the spokesperson, noted that the city is canceling the use of 360 emergency hotels and cluster sites, which will ultimately lead to a 45 percent reduction in the city’s shelter footprint. Brooklyn alone has about 93 shelters, 48 cluster sites and 22 hotel shelters, according to an NY1 analysis based on a Freedom of Information Law request, released a day before the mayor announced his new policy. According to city data, there are 1,197 cases, including 2,703 individuals, in shelters who hail from Community Board 5, which covers East New York. At the same time, about 1,368 cases or 2,171 individuals are currently housed in shelters actually situated in that community board. In the same area, there are 64 apartment units in cluster sites housing 201 individuals and 242 beds in commercial hotels that hold 411 individuals. 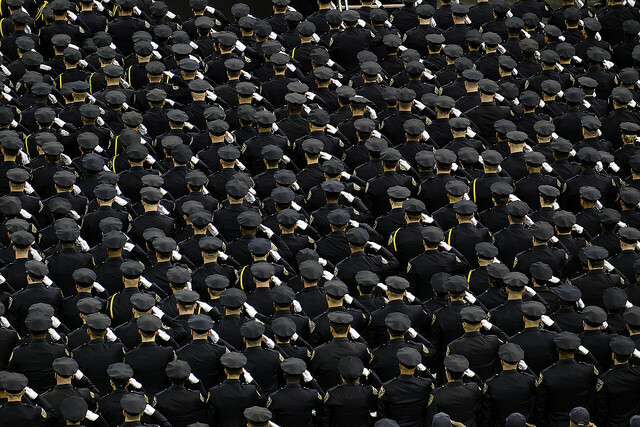 “We encourage all communities to join us at the table as we move forward," Rothenberg said. Naturally, Espinal also worries about how proposed federal budget cuts may also affect the neighborhood, even if they don’t necessarily affect the city’s rezoning commitments. “I represent a neighborhood that’s one of the lowest income communities in the city and we’re gonna face the same problems that any inner city community will face,” he said, citing education and health care as two important streams of federal funding. A repeal of the Affordable Care Act would be a particularly stinging blow to his community, he said. The future is not all anxiety and uncertainty, however. Along with the city’s commitments, Espinal recently received a welcome piece of news in Governor Andrew Cuomo’s Vital Brooklyn proposal, which would invest $1.4 billion in Central Brooklyn, including parts of East New York and Bushwick. The plan, according to a spokesperson for the governor, was months in the making and sought input from local and state legislators. 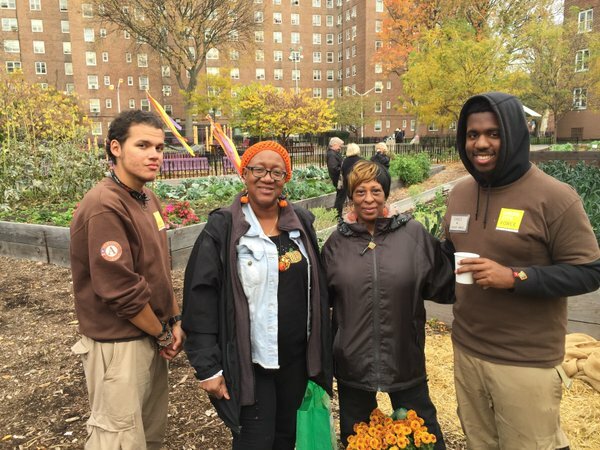 Vital Brooklyn includes investments in education, job creation, affordable housing, healthy food options, open and green spaces, among others. Espinal, who was with the governor at the announcement, said it brought back memories of the East New York plan which similarly addressed a comprehensive range of needs for the community. “I can’t speak to how much of that $1.4 billion is coming into East New York itself but you know it’s only going to enhance the work we’ve done,” he said. When asked, Espinal said he’d like to see the mayor and governor coordinate on the overlapping parts of the plans, but he doesn’t hold out hope for the feuding leaders, both Democrats like Espinal. “I would love to see coordination but if they decide to do things with their own priority and prerogative then I think that’s fine as well,” he said. 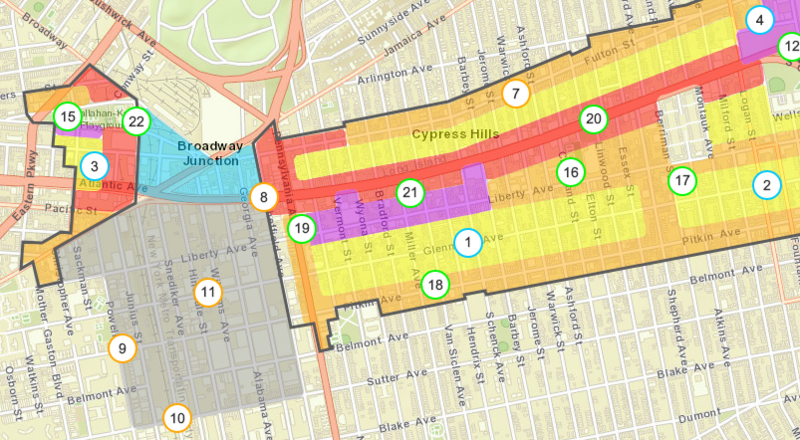 The Department of City Planning is currently studying a number of neighborhoods for the next rezoning after East New York. 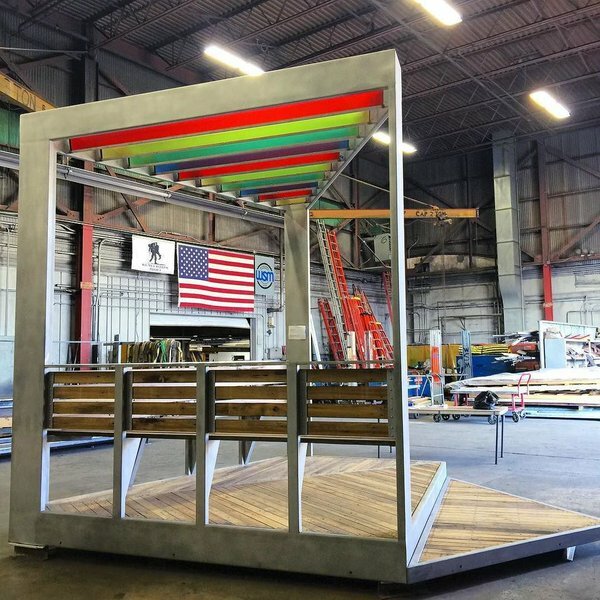 Furthest along in the process are Greater East Midtown and Downtown Far Rockaway, which are both undergoing public review, as well as East Harlem. The city is also conducting an environmental impact study in the Bay Street Corridor in Staten Island while another potential rezoning study, in Flushing, Queens, was “paused” in late-May after facing opposition from local legislators. My husband and I live in Bushwick in a one-bedroom apartment with our three children—one of whom has special needs—and my sister. We pay more than $1,200 per month—more than half of our income, which comes from my husband's job in a fruit and vegetable store. For the last two years, we've been looking to find somewhere better—somewhere more affordable, with more space for our children. Our landlord wants us out, too, because he wants to renovate and charge new tenants more as Bushwick gentrifies. But there's nowhere for us to go. Even studios near where we live are now renting for $1,400-$1,500—too much money, and too little space, for our family of six. In recent weeks, the city has heard much debate on how to create and preserve affordable housing. The most talked-about item has been the Mayor's Mandatory Inclusionary Housing (MIH) plan, which would exchange zoning changes to allow more housing construction for, in most neighborhoods, the requirement that 25–30 percent of apartments be affordable to people earning 60 to 80 percent of Area Median Income (AMI). The problem with the plan is that it won't solve the problem for working class New Yorkers like me. Sixty percent of Area Median Income is almost $47,000 for a family of three, and many New Yorkers are far from earning that. My family of six earns about half that much. As a recent Real Affordability for All (RAFA) report found, in many of the neighborhoods that are being rezoned—like East New York, the South Bronx, and East Harlem—the average income is far below 60 percent of Area Median Income. So, when I look at the MIH plan, I wonder: "affordable" housing for whom? Certainly not for local residents like me. Mayor de Blasio stood on the right side with our communities in the Fight for $15, to raise the minimum wage to $15 per hour for the 3.2 million low-wage workers in our state who currently earn less. But the reality is that, even once our families win the $15 per hour that we so desperately need, the vast majority of the housing being proposed in the MIH plan will not be affordable to us. We ask the Mayor to reconsider his plan and expand affordability to preserve and build genuinely affordable housing. Susana Salas is a member of Make the Road New York, the largest grassroots community organization in New York offering services and organizing the immigrant community. On Twitter: @maketheroadny.